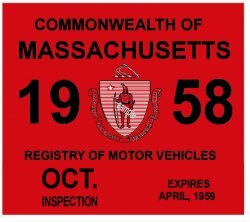 1958 Massachusetts Fall INSPECTION Sticker  - $20.00 : Bob Hoyts Classic Inspection Stickers, Add a Final Touch to your Restoration! This 1958 Massachusetts FALL INSPECTION Sticker has been carefully restored and reproduced front and back directly from an original. They were issued from October, 1958 to March 1959.